The chest was, for hundreds of years, the sole piece of storage furniture in the Greek house. In it were kept the family's most precious possessions, clothing, linen, jewellery, embroideries, tools, weapons, money, even foodstuffs and drinks. It was, at the same time, a good 'container' for transporting goods, since the traveller, the pedlar, the seafarer, and in general those who ventured to foreign parts, placed all their belongings in the chest. The chest is associated with many aspects of daily life and, only naturally, everyone attached great importance to it. Emigrants refer to it in their narratives and songs, when expressing their nostalgia for the homeland. But, more than anything else, the chest was uppermost in the thoughts and dreams of young girls when preparing their dowry trousseau. They placed this in the chest with ceremonial order, together with all their wishes and expectations. With the chest they carried the dowry trousseau to their new home, and in the chest they placed it again, for their children too to find it. What dreams, what hopes the maidens locked away in this box, together with their embroideries! What sighs and what songs did it hear being sung beside it! 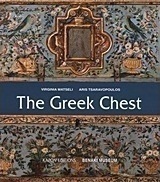 Γράψε μια αξιολόγηση για το The Greek Chest και βοήθησε σημαντικά τους άλλους χρήστες!